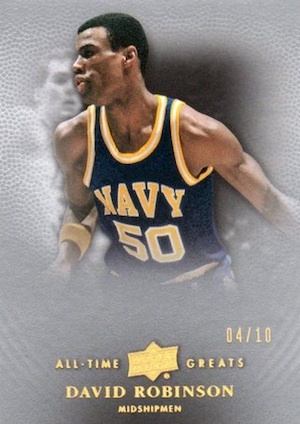 2012-13 Upper Deck All-Time Greats Basketball opts for quality over quantity when it comes to player selection. With a checklist that includes just 18 names, each single-pack box packs some punch, not to mention star power. Boxes of 2012-13 Upper Deck All-Time Greats Basketball come with three base cards and an autograph, all from the same player. An outer box hides the player found inside the tin pack. However, once the outer box is opened, a window in the tin shows who's inside. This means collectors can sell boxes blindly or as a player-focused pack. Base cards are numbered to 150. 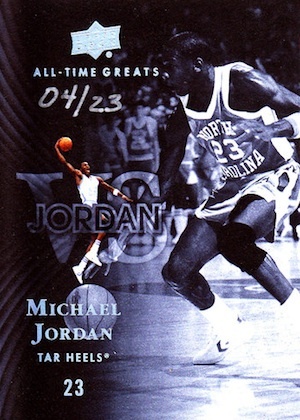 The checklist has 100 regular cards plus 20 Jordan Vs. cards, that focus on the players' connections to the game's greatest player. The base set comes with the parallels: Silver (#/50), Gold (#/10) and Signature (1/1). All autographs are signed on-card and come hand numbered. Numbered to 55, All-Time Greats Signatures are the most plentiful. They also have Silver (#/7) and Gold (1/1) parallels. 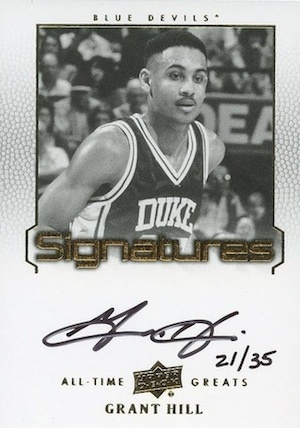 Jordan Vs. Autographs (#/23) are dual autographs that include Jordan and another player. 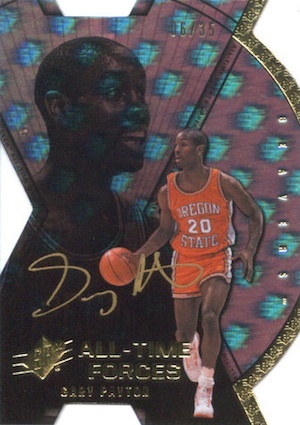 Book cards come in the form of Banner Season (#/25 or less) and Big Signatures (#/10). Other signature sets include Program of Excellence (#/23 or less), All-Time Forces Signatures (#/35) and All-Time Dual Forces Signatures (#/5). Special Team of Ages boxes come with five autographs. The signers? Jordan, LeBron James, Bill Russell, Magic Johnson and Gary Payton. 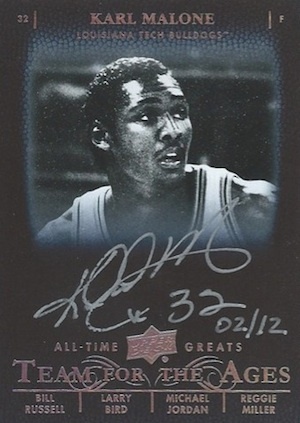 Across the entire 2012-13 Upper Deck All-Time Greats Basketball print run, Michael Jordan autographs fall 1:6 boxes. Really happy with the product…3 card base set of the same player I got the autograph of. The auto is a ripper. Not complaining in any way…but would be nice for the collector if unlike me, they get cards of more than one NBA player per box. Bought 3 boxes of the shelf of a sports card shop. First box i pulled a Jordan vs Reggie auto /23. Second box I pulled a Jason Kidd auto 1/1. And third box I pulled (what is probably the least expensive auto in the set) Isaiah Thomas auto 1/45. All in all I was thrilled.